With the Lunar New Year, the factory has shut down for the holidays leaving me with a handful of spare time in the afternoons. 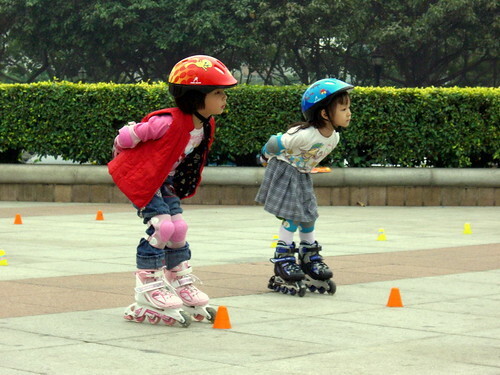 Hence, I decided to follow Faith to one of her Roller Blading lessons at the park nearby. It was a good deal for the lessons as it comes free with a purchase of the skates from them. As many lessons as you want or need, absolutely free. I guess Faith was having so much fun that wifey also bought a pair for herself. Considered me old skool as I have never bladed before, I am of the roller skates and skateboard (where it was made for speed rather than tricks) era. And before everybody starts visualising me like a Travolta grooving on skates, the answer is No. I have never been to a Roller Disco. Ewwww. Just a trivia here, during the "old days", there was one such Roller Disco at the basement of Goldhill Square before it was converted into a furniture showroom in the 80s. Right about where Cold Storage supermarket is currently occupying. Heather: Heh heh. Happy New Year to you! Ahhh.. So ke ai!! Especially the train one..
Kimberly: It was fun to watch the kids skate as well as being a great photo op. Too bad, it wasn't a bright sunny day or the pictures would have turned out better. From this experience, I conclude that the Panasonic Lumix is a far more superior camera than the Casio Exilim. I took blading lessons too last year and it was a humbling experience when a 5 year old out skates you in the class...sigh. ihawk98: Yah man... I saw some of these little kids. They can really blade! 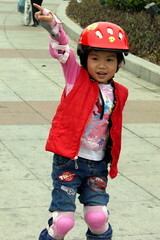 Kids in rollerblades are too cute for words!! :) Thanks for the cute pictures and happy new year to you! I see Faith likes the colour pink. Pink knee-guards, pink shirt and pink blades. Haha.